Femicide. A Gender Discourse. Presented at the University of Queensland, SJC Research Day 2014. Today I will be talking about a new word that was introduced let’s say 8 years ago in Italy and enabled a possible reading of an existing social problem. The new word is femminicidio. The dominant reading is gender. The social issue is violence between men and women. Let’s see where this term comes from. The linguistic /sociological meaning is “homicide of female”. The political meaning advocated by feminist Diana Russell since 1976 is male homicide of female because she is a woman. 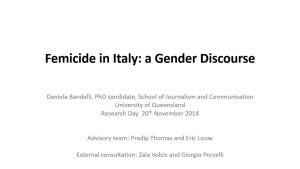 The political meaning then has expanded to the point that femicide is also used to define all sorts of discriminations against women, not necessarily ending with physical death. 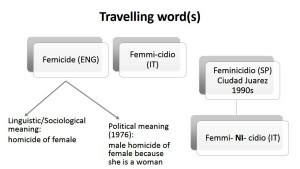 Corresponding term in Italy is FEMMICIDIO. This word never erupted in the public sphere and was the preserve of feminists and their associated publications.